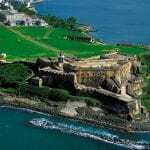 A team of physicists and astronomers from Puerto Rico, Latin America, Europe and the United States, have formed an international partnership to create a world class research institute in Old San Juan, Puerto Rico – “Colegio de Física Fundamental e Interdiciplinaria de las Américas” (COFI). The institute is an independent international center active in theoretical, computational and experimental disciplines, which started from a one million-dollar investment from Northwestern University and the support from the University of Puerto Rico. Other sources of funding include private donations, federal grants and contributions from national and international laboratories.